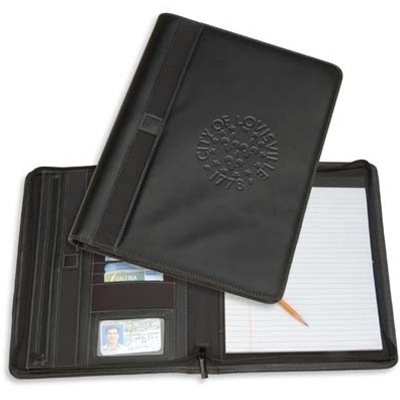 Add organization to the meeting-intensive week with this perfectly detailed black leather writing pad adorned with the Louisville Vintage Seal. Inside, you’ll find zippered and gusseted pockets for storing files, an interior elastic loop for holding pens or flash memory devices, and business card pockets. There’s also an external pen loop, and it comes with an 8.5" x 11" writing pad.